MojaWyspa translates in English as "My Island". It reflects the pride and sense of belonging of the Polish people now resident in the UK. The founders of the site moved to the UK from Poland more than 10 years ago. Many Polish people contacted them to find out what life was like here for them and what opportunities there may be for others coming across to start a new life. Eventually, there came a point when so much of their time was spent on the phone, giving information to those keen to move here, that their core business began to suffer. Realising the need for accurate information and the growing numbers of those seeking answers, they created their first website to help deal with the demand, drawing on their direct experience of what was relevant. This onine community has grown organically, always in touch with what its thousands of users need or want, and has remained a trusted and valuable resource. The website, running since 2003, has maintained its leading position within this growing community. Since Poland joined the European Union in 2004, the Polish community in the UK has increased dramatically and www.MojaWyspa.co.uk is firmly established as a prime service for the Polish online community in the UK and for those outside the UK to find out about what life here is really like. The website carries a blend of regularly updated information in easily navigated sections covering News, Woman and Child, Poles in the UK, career information and sub-sections offering easy access to the information this growing community needs. 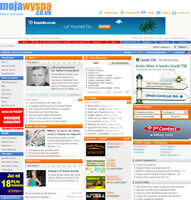 The site is professional and highly regarded by the Polish community; indeed many of the MojaWyspa featured articles are often quoted in the Polish media, generating further interest. The potential audience is an estimated 2,000,000 Polish people who have moved to the UK in recent years. About 70% of the regular site users come from this group; the other 30% are an international audience, mainly from Poland and the USA. In the beginning it was mainly young Poles coming to the UK for a short time to work and to make some money. In recent years this has changed and a very large part of the regular users are families who are planning to stay in the UK for a much longer time. Although the English speaking skills of these people are growing rapidly, the complex process of integration into a new culture is easier in their native language. Even as time goes by and the language problems dissipate, there will still be a strong cultural and linguistic bond within the group. MojaWyspa is planning to increase the English language content of the site to meet the anticipated demand that will come from the younger members who are being educated in English. The Home page provides a gateway to all sections and services. MojaWyspa.co.uk provides a wide range of information to the Poles living in or planning to migrate to the UK. News and articles provide the biggest information medium for the Polish community in the UK, through cooperation with a number of Polish newspapers based in UK and Poland. This is a two-way flow as many features and articles originated on the site have been reprinted in these newspapers. The main focus is on the UK, where anything that concerns the Poles in their everyday lives in Britain, i.e. work, law, taxes, insurance, etc are regularly updated. The service is enhanced by a very popular notice board, where additional information is submitted by users. The Forum is the fastest growing section of the website. Broken down into subject sub-forums created by the members it provides an effective and comfortable environment for users to discuss and exchange information. FAQs is one of the most popular sections with a searchable database of the most frequently asked questions has been built up over the years. This gives a user the quickest and easiest way to answer an immediate question. Also the very popular Classified advertising section provides a free service for members. Government and Local Authority Information. Each section is further broken down for ease of use and speed of reference and contain links to important other sites. The Gallery section publishes selected photos of from our members and from events all over the country.